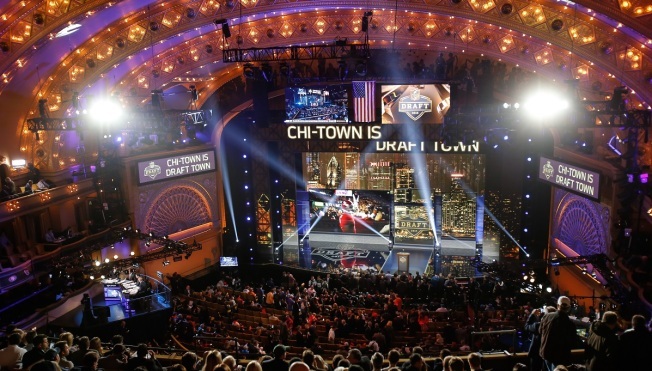 File - A general view prior to the start of the first round of the 2015 NFL Draft at the Auditorium Theatre of Roosevelt University on April 30, 2015 in Chicago, Illinois. By virtue of their loss to the Detroit Lions on Sunday, the Chicago Bears finished the season with a 6-10 record and will have the number 11 pick in the 2016 NFL Draft this spring. The Bears, who picked seventh overall in 2015 when they finished 5-11 in Marc Trestman’s last season at the helm, were hurt by their high strength of schedule this season, as it’s the first tiebreaker used to determine draft order. Three other teams that finished at 6-10 will pick ahead of the Bears, with the Miami Dolphins, Tampa Bay Buccaneers, and New York Giants rounding out the top 10 in the draft order. The top pick in the draft, which will take place in Chicago, will go to the Tennessee Titans. The Titans picked second last year, selecting quarterback Marcus Mariota out of the University of Oregon. The rest of the top five will feature the Cleveland Browns, who fired their head coach and general manager on Monday, the San Diego Chargers, the Dallas Cowboys, and the Jacksonville Jaguars. As for which player the Bears will take in the draft, there are numerous options that are on the table for G.M. Ryan Pace. The team could certainly use another impact player on defense, and that would likely come on the defensive line, as it’s one of the stronger positions in this year’s draft class. The Bears could also dip into another strength of the class with an offensive lineman, as they’ll almost certainly be looking for at least one or two new starters for next year, and they could also opt for an inside linebacker or cornerback.